This place is never accommodating. Everyone in the room is BIGGER, STRONGER, and FASTER. You get TACKLED as soon as you enter the room. Once on the ground, you get CHOKED unconscious. You leave with bruises all over you body. The amenities are bare bones. The place can go for days in the winter with out running water. If you stopped showing up, no one would notice. Despite all of this, you rearrange your schedule to show up 3 times each week. You absorb the BEATINGS, learn the LESSONS and adjust your ACTIONS. Welcome to “my place” – my Gracie Jiu Jitsu academy. The Martial Arts have been my SECRET WEAPON for over 20 years. The Martial Arts have kept my MIND open, BODY tone & SPIRIT strong. In high school, my martial arts journey began by trying to KNOCKOUT ceiling tiles with jump spinning kicks at a Tae Kwon Do school. In college, I jumped into an intense 5+ years of Japanese Shito Ryu Karate under a fantastic SENSEI. After college, I moved back to Philadelphia and spent the next 10 years learning Ed Parker’s Kenpo Karate. All fantastic learning experiences. Each art had a positive effect on my life. Each lesson was a GIFT. I grew physically and matured mentally. Along the way, Steven Segal convinced me to spend a summer training Aikido 3 days a week. I saw his movie “Above the Law” and became became obsessed on learning how to “close line” someone. I found an Aikido teacher who took me in for the summer. Despite getting a mild concussion from the instructor “close lining” me during a demo, it was a great learning experience. Each of these martial arts have taught me LIFE LESSONS. However, I always felt something was MISSING. Enter Gracie Jiu Jitsu . . . REALITY CHECK: After UFC 1 Gracie Jiu Jitsu became the rage. Royce Gracie shook up the martial arts world. Despite my years of training, I quickly realized I knew nothing about fighting on the ground. I had my first martial arts “early life crisis”. FAST FORWARD: I did some research and found an instructor who trained Jiu Jitsu directly under the Gracie family. NEW BEGINNINGS: To move forward, I had to “leave my EGO at the door.” I traded in my 2nd degree BLACK BELT in KARATE for a WHITE BELT in Gracie Jiu Jitsu . I gave up being one of the senior ranked students in my karate school to being a Jiu Jitsu floor mat. I get ROLLED up and WIPED up each class. It was one of the best decisions I ever made. I NEVER leave a Jiu Jitsu class with out feeling tired, bruised, and totally spent. I am in the best shape of my life. Some of the most INTERESTING people I ever met, I met training Jiu Jitsu. I learn something about the WORLD and MYSELF each time I walk through the academy’s doorway. 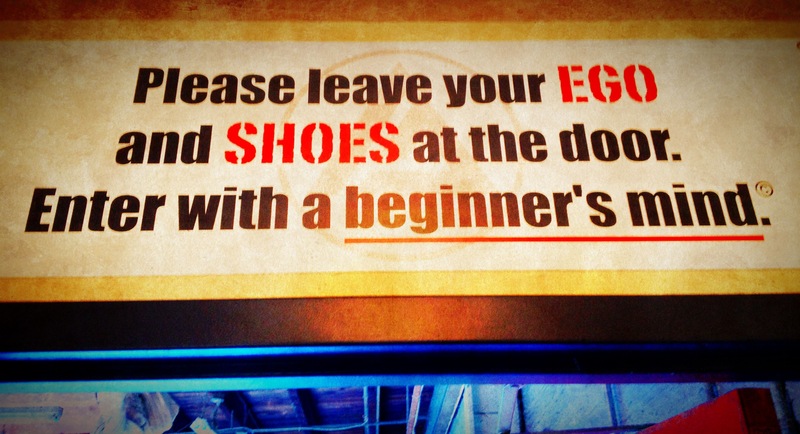 WELCOME & WARNING: To enter the academy, EVERYONE must pass under a sign that says, “Please Leave Your EGO and SHOES at the Door. Enter with a beginner’s mind“. Living this mindset will set your life in a REMARKABLE direction. This entry was posted in New Beginnings and tagged Above the Law, Aikido, Benjamin Franklin, Black Belt, Ed Parker Kenpo, ego, Gracie Jiu Jitsu, Joe Ciccarone, Karate, remarkable, Royce Gracie, Sensei, Shoes, Steven Segal, Tae Kwon Do, UFC, White Belt. Bookmark the permalink.